About half (46%) of agencies are “unsure” if they trust programmatic to execute ad buys, according to Strata’s latest agency survey, taken during Q2 2015. That’s up from the roughly one-third of agencies that said they weren’t sure if they trusted the tech at the beginning of the year. One-in-five agencies reported that they do trust programmatic, which Strata notes is a 49% increase from last quarter, while 11% do not trust it, a drop of 32% quarter-over-quarter. However, when looking at previous Strata agency polls, it appears that agency trust in programmatic has plateaued. During Q3 2014, for example, 20% of agencies said they trusted programmatic — the exact same number reported in Q2 2015. 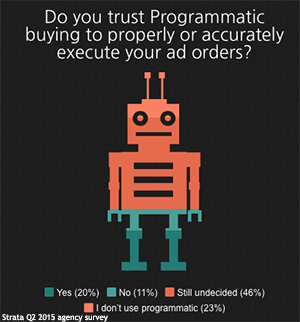 And in Q4 2014, about one-in-four (24%) of agencies said they trust programmatic. In other words, for about a year now, the number of agencies that fully trust programmatic has been hovering somewhere between one-in-four and one-in-five. That’s about the same number of agencies (23%) that reported in Strata’s most recent survey they don’t use programmatic. But these trust issues haven’t stopped agencies from using more and more programmatic to carry out their business. Strata notes 17% of agencies (an increase of 244% from one year ago) say they use programmatic to carry out between 20% and 40% of their business. Another 39% of agencies (up 18% from one year ago) use programmatic for 10% to 20% of their business. This increased spending also comes at a time when agencies are still wary of quality issues. Per the survey results, 30% of agencies say “inventory transparency” is the top concern associated with programmatic buying, followed by quality of inventory (28%) and the lack of education in the space (18%). The benefits of programmatic, per the agencies surveyed, are improved audience targeting (27%), improved buying efficiency (26%) and improved campaign insights (20%). Data from the Q2 2015 Strata agency survey can be found here. 2 comments about "About Half Of Agencies 'Unsure' They Trust Programmatic". Bob Gordon from The Auto Channel, August 27, 2015 at 12:29 p.m.
James Smith from J. R. Smith Group, August 28, 2015 at 7:51 a.m.